Cats have an instinctive urge to scratch. They do this to keep their claws sharp, and to remove the outer dead layer. Once the outer layer is removed, it reveals new sharp claws underneath. Scratching is enjoyable, allows cats to stretch out and burn off excess energy. 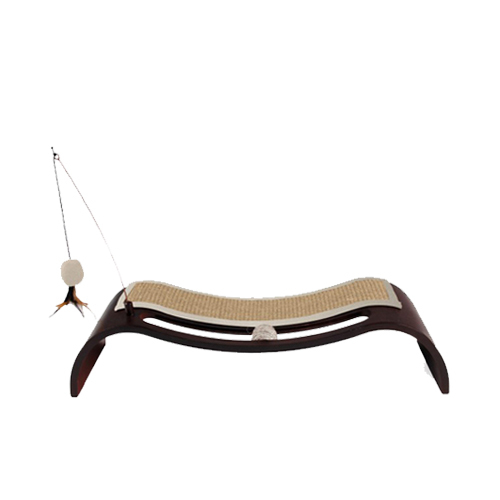 The Classic Comfort scratcher by AFP combines a stylish design with functionality. This way, AFP takes care of an essential part of a cat's surroundings. The design of the floor scratcher also allows your cat to lie down comfortably. The scratcher is also equipped with two toys for your cat. Fitted with sustainable canvas and jute to ensure optimal scratching fun. Contains two toys. The first toy is a rolling ball covered with sisal. The second toy is a ball with feathers that dangles from a rod. The two toys are part of the scratcher. Have you used AFP Classic Comfort - Roller Ball Floor Scratcher before? Let us know what you think about this product.